West Virginia has many places with high populations of crappie and some of these places are as follows; Stonewall Jackson Lake, Beech Fork Lake, East Lynn Lake, Sutton Lake, Stone coal Lake, Burnsville Lake, Summerville Lake and Tygart Lake. Many small lakes, rivers, ponds are ideal places to find crappie and the state record for crappie has been set by the Meathouse Fork with 4 pounds and 4 oz. weight. The crappie has been classified into two groups. White crappie and black crappie and these fishes have been introduced into many waters. The black crappie usually found in deep impoundments with slightly stained or clear water with some coverings such as trees. Whereas, the white crappie prefers warm, murky or slightly stained waters with slight current and some coverings. Still fishing, trolling, drifting and other similar techniques are ideal for crappie anglers. So these places are perfect to fish for crappie. Once you decide to go for crappie fishing in West Virginia you should pack some live bait, jig suitable for crappie, or a crappie lure preferably small one. Top baits for crappie are live baits, spinners, crappie jigs, spoons, small worms and other similar baits are perfect for this fish. If you are fishing for crappie in cold water make sure that you move the bait slowly because this fish moves slow in cold waters. 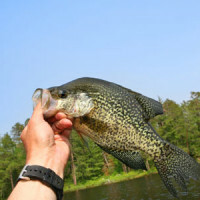 During the spring time when the crappies spawn they are usually located in brushy areas and some other covering places. Like almost every other fish the crappie usually stays lower when the sun light is directly on the water. So you should bear in mind that if you are going to fish for them during the day you should fish deeper however dawn is perfect for anglers who are after this fish. During night time the crappie moves back to deeper areas and sometime moves to the surface for feeding. Overall crappie is one of the easiest fishes to catch in West Virginia and they are great for beginners as well as professionals. With many lakes, streams, ponds and rivers that have high populations of crappie in West Virginia, it will be a great fun and you will want to come and fish again.